Scarves offer almost infinite scope for collecting by theme. Be the scarves modern, 'retro', vintage or genuinely antique, similar patterns and motifs appear and re-appear across the decades and can form a fascinating collection. From skiing to gardening, dogs to medieval history, nautical or equestrian pursuits to architecture... one of the wonderful things about scarves is that you can find designs to illustrate and reflect pretty much any interest you choose. Bear in mind that even within a theme you may wish to specialize. 'Flowers', for example, is probably an unrealistically broad area for a scarf collection, as there are just so many beautiful examples available. Roses or perhaps peonies, however, could form the theme of a lovely collection. Scarves are used in advertising campaigns more than you might imagine. They are commonly used to advertise perfume and cosmetics, of course, but all kinds of goods feature - from books to alcohol to automobiles. 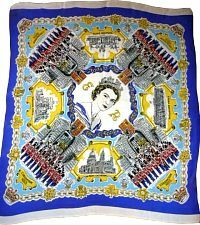 Royal persons who have featured on scarves range from Tutankhamun and Cleopatra, via Elizabeth I and the Six Wives of Henry VIII to the present Queen of England. Commemorative scarves have traditionally been issued for coronations and Royal weddings. Interestingly, head scarves continue to be considered a fitting canvas for royal images. For the wedding of Prince William and Kate Middleton on 29th April 2011 it was decreed that the approved Royal Wedding images, Arms and text can be used on head scarves, wall hangings, cushions and carpets. However, they cannot be used on clothing and textiles, including aprons, tea-towels or drying cloths (source: The official website of the Prince of Wales). You might not immediately associate wartime with fashion accessories, but WWII is a surprisingly rich theme to collect. Be it original silk 'escape map scarves' (issued to pilots in case of capture), scarves commemorating key events (the Japanese surrender, VE day) or the wonderful wartime propaganda scarves produced by, among others, the Jacqmar fashion house, there's plenty of both history and artistry to collect. Dress and accessories featuring eastern-influenced designs and motifs have been popular for several hundred years. Indeed, the classic 'paisley' design is derived from a motif originating in India and Persia. Eastern landscapes, cherry blossoms and bamboo, oriental figures and even dragons give plenty of scope for a charming collection. With a bit of searching you should be able to find calendar scarves for pretty much every year dating back to at least the 1940s. A quick search on Ebay at the time of writing brought up calendar scarves dating to 1953, 1967, 1968, 1969 and 2000. In addition to standard calendar prints, you can also find zodiac calendar designs. Of course, our calendar 'repeats', in that the pattern of dates/days for a particular year reoccurs roughly once a decade (see WikiAnswers for a full explanation). The calendar for 1953, for example, will next reoccur in 2015. A limited but rather fun niche! These might include commemorative scarves, but also those with a personal message or inscription. 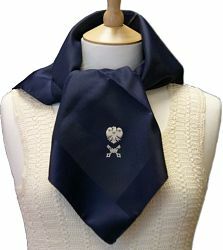 There are also scarves designed to feature an area or cartouche left blank for a message to be added in pen. Scarves have long been an integral part of many female corporate uniforms, complementing the wearing of ties by male staff. Most airlines have incorporated a scarf into their stewardess uniform at some point in their history, and many continue to do so today. Banks and other businesses that need to present a 'public face' also commonly use scarves as uniform. 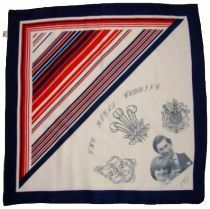 Examples such as this 1980s scarf, issued to female employees of UK bank Barclays, are both attractive accessories in themselves, and a little piece of social history. Scarves often provide the canvas for reproductions of famous paintings and artworks, from Japanese woodblock prints to the works of Van Gough, Picasso and many others. Klimt's works in particular are commonly rendered on silk. The current fashion for 'collaborations' between artists and fashion designers makes this a particularly interesting area. A collection of paisley scarves and shawls of various periods - from mid-19th century cashmere shawls to the present day fine wools and silks - could be a fun project. 1970s psychedelically-colored paisley designs certainly make an impressive contrast with Victorian originals! Don't overlook hand painted scarves - the best ones are truly exquisite and well worth collecting even without that designer label. Craft and textile art shows are the main place to find them, but you may occasionally be lucky at the local thrift shop. From abstracts to marbled designs, florals to reproductions of great art... anything is possible with hand-painted scarves!